Members of the South Coast Tourism Steering Committee met in Powers on July 18. The Outdoor Recreation Team shared information on the Coos Flow Trail, a 30 miles mountain biking trail that is currently under construction between Bandon and Coos Bay. The Team will be pursuing a Travel Oregon Rural Tourism Studio grant to support this and other efforts including a ribbon-cutting opening event for the completion of the first 11 mile segment which is expected to take place in the fall. The Marketing Action Team, discussed the Team’s two priority goals: 1) To create up-to-date information on the Travel Oregon website for businesses and restaurants and 2) To develop high quality photography to represent the South Coast. The logistics of both projects are still in the process of being finalized. The agritourism team also provide an update on efforts related to creating Farm Trails to help market local producers and farm experiences. The Team is looking to receive funding for a Farm Dinner, an agritourism development program that seeks to connect producers, buyers, hotels, and other businesses. The Committee will meet again on August 23rd in Coos Bay to finalize the details of the proposal and are planning to have the grant finalized and submitted mid-September. Despite being skilled swimmers, harbor seals face a number of threats in the ocean. There is currently no commercial hunting of harbor seals, but some native subsistence hunting of seals still occurs. Because they compete for many of the same species of fish, harbor seals are sometimes killed by commercial fishermen. Seals can also become entangled and drown in fishing nets and gear. In addition, the species is preyed upon by killer whales, sharks and Steller’s sea lions. El Niño events can decrease the animal’s food availability, which includes a variety of fish, shellfish, and crustaceans. Florence, OR is a coastal city located at the mouth of the Siuslaw River about midway between Newport and Coos Bay. With a population of approximately 8,466 people, Florence is a historic riverfront town that provides a diverse array of activities for locals and visitors. Heceta Head Lighthouse. Image Source. While the logging, commercial fishing, and agricultural industries have served as the historical pillars of Florence’s economy, tourism is becoming increasingly significant. There are a variety of businesses, points of interests, and parks in and around Florence that offer unique experiences and outdoor recreation. One can enjoy headliner entertainment at the Florence Events Center or Three Rivers Casino Resort after exploring the Heceta Head Lighthouse State Scenic Viewpoint and the Heceta Head Assistant Keeper’s House. The park features a seven mile network of hiking paths that join the short hike to the lighthouse. The Keeper’s House functions as both an interpretive center and a bed and breakfast. Guided tours are offered by knowledgeable docents during the summer to educate visitor’s about the iconic lighthouse and its rich history. The Sea Lion Caves. Image Source. A must see attraction located fifteen minutes from the Florence city center is North America’s largest sea cave, which is a privately owned wildlife preserve and bird sanctuary, and is inhabited throughout the year by as many as 200 Stellar sea lions. Visitors can take an elevator ride descending 200 feet down into the Sea Lion Caves, which is as tall as a 12-story building and as wide as a football field. 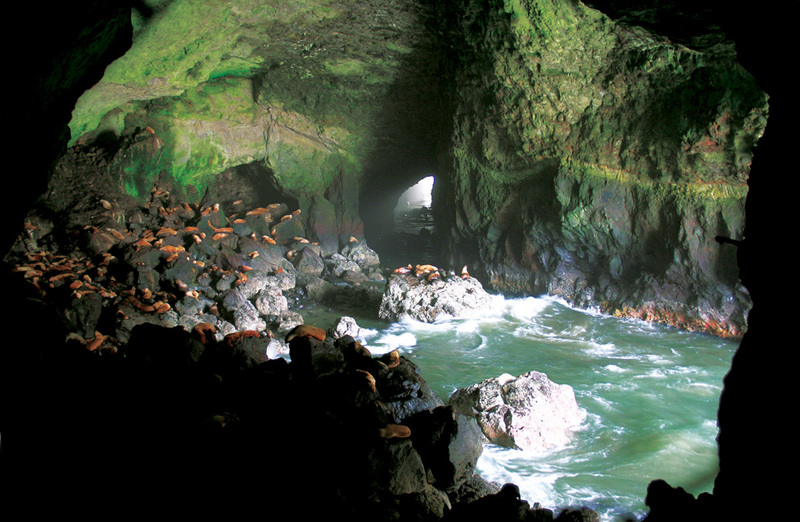 As the Sea Lion Caves are part of the Oregon/Cape Perpetua Marine Reserve, the Caves are not a zoo; the wild animals are protected and come and go as they please and follow their natural . During the summer, the sea lions can be found lounging in the rookery areas (along the rock ledges outside) with their young. In the fall and winter, they can be found inside the cave’s natural amphitheater. This sea cave is the only known mainland home of wild sea lions in the world and is a must see for visitors of Florence.